Looking for Ways to Cut Your Utility Bill? Look Up! With the price of utilities continually on the rise, home and business owners alike are looking for ways to save. What you may not know is that your roof can actually help you cut down on your energy expenditures. In this article, we will show you the different ways how. Have you heard of a cool roof? While we happen to think all our roofs are ‘cool’ relative awesomeness is not what we’re talking about here. This is a roof which reflects the light from the sun so that it is not absorbed, thus heating up the building. In order to create the reflective effect, reflective paint, shingles, tiles or sheet coverings are installed. This reduces the amount of air conditioning needed to cool the building. Studies by the United States Department of Energy have shown that with the installation of a cool roof, you can save up to 15% on energy bills every year. So they are good for the environment, and they help towards lowering your carbon emissions. Lastly but no less importantly, a cool roof system has a far longer lifespan than a regular roof due to the fact that it does not get as hot. Win-win! The next thing to look at is fixing all damages or leaks in your roof sooner rather than later. Even if it is only a small leak, you can be sure it will soon get worse, spreading through the roof and may even cause structural damage. In this case, water seeping into the roof will cause the insulation to become covered with mildew and mold which not only ruins the effectiveness of the insulation but is a danger to occupants of your home or business. Loose or missing tiles should also be replaced immediately, & those damages should be repaired in order to keep the building sealed. Lowering our carbon footprint as well as ensuring energy efficiency are the new watchwords when it comes to roofing installations. Choosing an energy efficient material can really pay off in the long run. Studies have shown that on average, Americans spend around $2000 on utilities a year. By using energy efficient materials throughout your structure, households can save as much as 20%. Of course, different materials have pros and cons and the material the roof is constructed of makes a difference. Tiles: Offer great weatherproofing, are versatile and look very attractive. They can also be coated with a reflective paint in hotter climates like ours. Membrane: This is perfect for a flat roof or one with a very shallow angle. It offers excellent heat reflection. Metal: This is often the best option for houses situated in harsh weather climates (ahem, New Orleans.) Not only is it durable, but it will reflect heat effectively. Lastly, as roofs degrade with time, yours should be inspected at least twice a year. This means any potential problems can be found before they become more serious and they can be repaired accordingly. Bear in mind that moisture, ice, and cold can damage your roof, especially if there are already some imperfections. 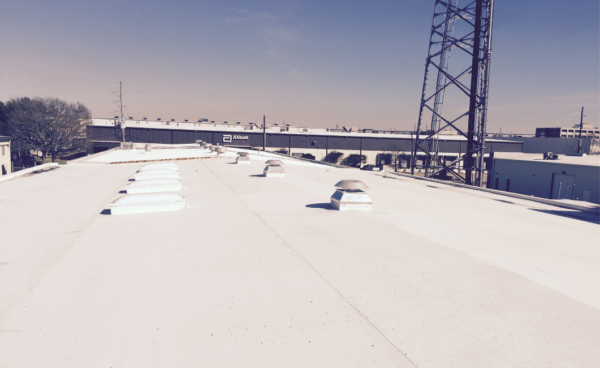 These imperfections will allow water into the roof itself, which could become serious leaks. Not only that, this water will expand and shrink as it freezes and unfreezes. This will only hasten the appearance of even larger leaks. An inspection before winter starts will identify imperfections and repair them. Our intense summer sun can cause your roof to crack, tear or peel, depending on the materials it is constructed from. Not only can this become a problem in winter (or with summer rains), but the energy efficiency of the roof itself is compromised. Again, a roof should be inspected before the advent of the summer months to identify any potential problems. With these facts in mind, you may be interested in learning more about how you can make your business or home’s roof more energy efficient. To learn more, get in touch with our experts at JOI Roofing today. You have seen the benefits, now let us help you reap them!